The dream of home ownership led Amy Sefcheck to apply for a home rehabilitated by Adams County Habitat for Humanity , and last summer that dream became reality as she and her two children moved into a Biglerville home. On Sunday, May 19, the home was officially dedicated in a ceremony by Habitat board members. Dedication Day: Biglerville resident Amy Sefcheck and children Vincent, 9, and Abigail, 7, are surrounded by Adams County Habitat for Humanity board members and spouses Sunday during a formal dedication and blessing of the home. 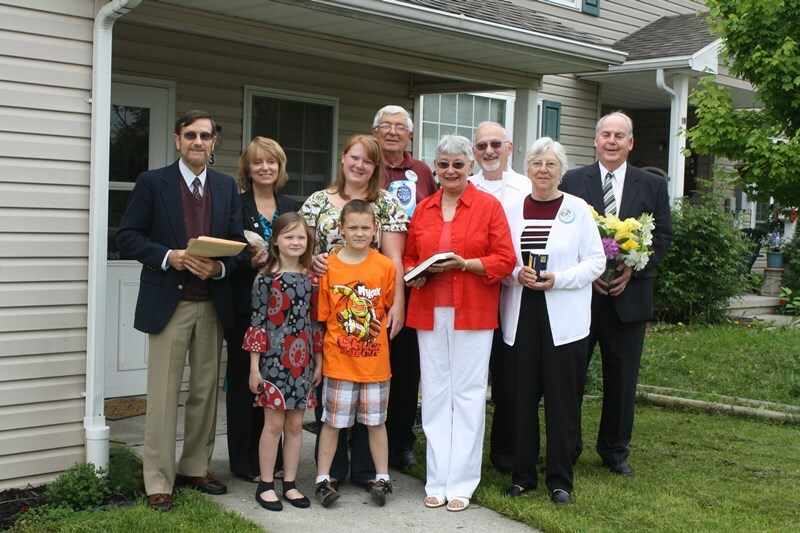 In a ceremony of blessing led by Lynn Cairns, a retired pastor and Adams County Habitat for Humanity board member, fellow board members accompanied the family into the house, saying a special prayer for each room. A Habitat homeowner’s basket was also presented to the family, containing the following items: a Bible so the family may have a firm foundation in faith, flowers so the family may always know beauty, bread so that the family may never know hunger, salt so the home may always have flavor, a candle so the house will never know darkness, and sugar so that life may always be sweet. In 2012, more than 300 volunteers spent nearly 1,500 hours working on Adams County houses, including the Sefcheck home. Hundreds of additional hours are donated to the non-profit, ecumenical Christian organization every year through the work of board members. The organization is run entirely by volunteers. 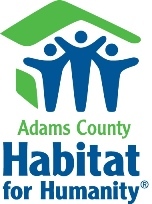 Adams County Habitat will be holding a Blitz Build to jump-start the construction of a new home on Fifth Street, Gettysburg on June 6-8 and 13-15. To volunteer, contact volunteer committee chair Bob Remaley at coachremaley (at) comcast.net.